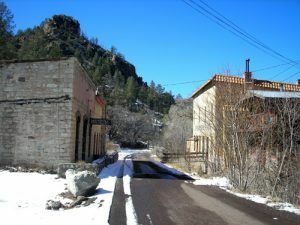 In the Winter of 2008 we explored many ghost towns of New Mexico, and spent some time in the Silver City area. Cinco de Mayo celebration, Mogollon, N.M, 1914. About 12 miles northeast of Glenwood, New Mexico is one of the Land of Enchantment’s premier ghost towns – Mogollon (pronounced “muggy-YOHN” by locals). Today, a ghost towner’s dream, filled with historic buildings of the once rich mining camp that made millions during its heydays, survived numerous floods and fires, but still hangs on today despite its isolated location. It all began when a soldier named James Cooney from Fort Bayard, some 80 miles to the southeast, was scouting for the 8th U.S. Cavalry in nearby Mineral Creek Canyon 1870. North of where the mining camp of Mogollon would later be established, Cooney discovered rich gold and silver deposits, but unlike many miners of the times, he kept his find a secret. Unable to work his find as his “hitch” in the Army was not yet complete, Cooney returned to his duties. However, several years later, when Cooney was mustered out of the service in 1876, he returned to the area, filing several claims. 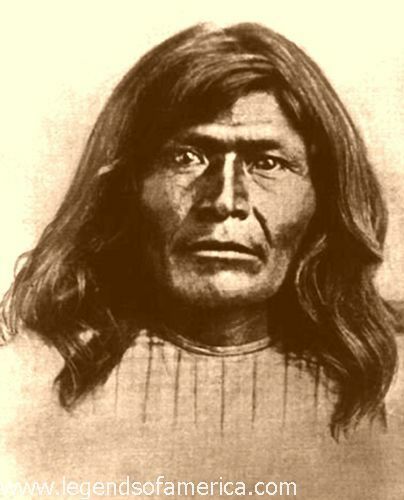 Not long after, Cooney, along with his partner, Harry McAllister, were chased out of the region by hostile Apache. Determined though, they returned two years later and began to work the rich veins in earnest. Word spread and soon the area was crawling with numerous prospectors looking for their own fortunes. But, the miners remained at risk from the angry Apache. 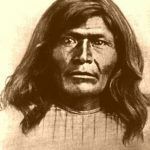 In April, 1880, Chiricahua Apache, led by Chief Victorio, once again raided the area, including Cooney’s claim. Three of the prospectors, including retired Sergeant James C. Cooney, were killed. Also killed in what is called the “Alma Massacre,” were 35 area sheepherders. Though the Indian raids continued, it didn’t stop the flood of prospectors. James Cooney’s brother, Michael, having inherited the claim, soon arrived from New Orleans to continue his brother’s mining operations. Soon afterwards, he built a vault from a large boulder as a permanent resting place for his fallen brother. The vault, which was sealed with silver-bearing ore taken from Cooney’s Mine, still stands at the Cooney Cemetery, located about 7 miles east of Alma, New Mexico. In the meantime, several other miners had made discoveries and soon the mining camp of Mogollon sprang up in Silver Creek Canyon, which included a sawmill and several businesses. In 1890, a post office and jail were established and two years later, the first school was built. The Silver City and Mogollon Stage provided transportation and freight services to the camp, moving its “cargo” some eighty miles between the two points, a distance that took about 15 hours. A number of mines were developed in the area including the Maud S., Deep Down, Last Chance, and the biggest and most profitable – the Little Fannie. Though it would employ the most people and drew out the most ore, it was also an extremely dusty mine, resulting in numerous cases of “Miner’s Consumption” or “Black Lung” disease. This created quick turnover at the mine as the town’s transient population surged and fell from between 3,000 and 6,000 residents during the 1890s. 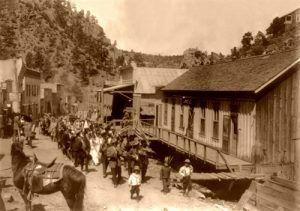 During these days, Mogollon also earned a reputation as being one of the wildest mining towns in the West, as gamblers, stage-coach robbers, claim jumpers, and gunmen all called the mining camp home. From its earliest days, Mogollon was plagued with fire and flood. The first big fire occurred in 1894, wiping out most of the town buildings. However, Mogollon’s citizens persevered, rebuilding, this time, with brick and adobe. That same year, the mining camp also suffered from a devastating flood from the melting snows and heavy spring rains. Other floods would follow in 1896, 1899 and 1914, all taking with them homes, mining operations, and some of the town residents as the swift waters overflowed from Silver Creek. More fires would also occur in 1904, 1910, 1915, and 1942, each resulting in yet more devastation to the town. Mogollon, New Mexico Main Street, 2008. By 1909, Mogollon had a population of about 2,000 people who supported five saloons, two restaurants, four merchandise stores, two hotels and several brothels located in two infamous red light districts. It also boasted the Midway Theatre, a bakery, a photographer, a couple of doctors, and various other retail businesses. Though its population was slowly dropping as technologies were advanced and the ore began to diminish, the year 1913 saw about 1 ½ million dollars in minerals taken from the area mines. In the meantime, Michael Cooney who had taken over the original claims after his brother’s death, was also destined to tragedy. In 1914, he was still combing the mountains for yet more gold. However in October, he failed to return home. Search parties were sent out to look for him, but at the high elevation and winter’s arrival, they were forced to abandon their search. Four months later, Michael Cooney’s body was discovered in a nearby canyon. He had frozen to death. 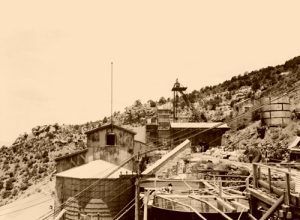 By 1915, Mogollon’s population stood at about 1,500 residents, who enjoyed new utilities such as electricity, water and telephones.